Do you want to experience the real romantic Tuscany lifestyle of then and today - history and modern comfort? - then the 'Villa' is the place for you. The Tuscany 'Villa' is located in a tiny medieval hamlet closed to the famous fortress of Monteriggioni. Mid way between Florence and Siena it is most central to all important sights of Tuscany. This luxury Villa represents 700 years of Tuscany history, once being part of the fortified hamlet of Strove. Completely renovated some years ago and retouched in 2013, it still has its typical flair thanks to its original old oak beam ceilings and "terracotto" floors. It is elegantly but very comfortable furnished with beautiful antique pieces of Tuscany , most of them handpicked over years by the owners, the young, cosmopolitan Italian couple Alessandra and Emanuele. With its back and sides, the Villa is incorporated into the external, fortified walls of Strove. Step out the back door and you are right on the old charming market place, within steps to shopping facility, a bar and restaurant. The house's front with the lovely terrace is facing to the east with breathtaking 180° views onto the close Siena hills, the below gardens with private Pool and the famous Monteriggioni castle. Its setting is very private. This is a "Natural resort Area" where it is possible to watch protected birds and sometimes, during the evening roe deers and foxs. Arrival is on the circular village road, used only by very few locals. Since the house has a raised position, entry to the property is up some stairs to the airy terrace with plenty of Tuscany garden furniture inviting you to a sun-flooded breakfast or 'alfresco aperitif' admiring the surrounding scenery. A jasmine covered cast-iron fence guarantees privacy. Smelling roses are located at the house iron gate entrance. One enters into the vast ground-floor L-shaped reception area that also serves as dining room and cosy lounge (Satellite TV, dvd, cd player) Wi-Fi free Internet access . Part of the room is also occupied by the well-furnished kitchen with its raised open fireplace . The kitchen offers all that a cook might want: a 4 flame gas stove, electric oven, large fridge/freezer combination, dishwasher, microwave, american + italian coffeemaker, toaster, plenty of dishes and pots, etc.etc. A staircase of Tuscany grey sandstone leads upstairs to the sleeping and living sections of the house. At the top of the stairs is a sliding door that opens onto a hall. To the left is a twin bedded room (beds can be united into a double on request), with ensuite complete bathroom with shower stall. To the right is a beautiful double bedroom with ensuite complete bathroom with shower stall. A last door in the hall, to the left and down one step, opens into the formal living room with large monumental fireplace, large enough to burn entire logs, decorated as it is customs with the family's coat of arms. On the left of the living room are doors to two bedrooms: a double bedroom with delightful eagle nest-type balcony with breathtaking views and a twin bedded room, both with ensuite complete bathrooms with shower stalls. a bedroom with small queensize bed and fully equipped bathroom may be booked additionally . A door on the right of the living room remains closed. On the right and down one step, is a landing with a door that opens onto an external flight of stairs that leads down to the hamlet piazza, where guests can arrive also by car to let off luggage. Another door in the landing opens into a laundry room with iron and ironing board. From all large airy windows (all fitted with mosquito screens) you may admire the Siena countryside at your feet. Across the road one enters through a cast-iron gate into the paradise of a 5000 sqm well-cared park area with its Pool (7x14 mt) at exclusive use of our guests, extended lawn, laurel hedges, fragrant roses, a grape-covered loggia and barbecue facilities. A small cottage houses with changing facilities. Inside this garden is also the parking area. All this is reserved for the private use of guests only. Olive groves, vineyards and fields surround the garden with views spacing from Monteriggioni to San Gimignano and the Chianti hills. Only 6 km away the large town of Colle di Val d'Elsa with major shops, facilities and 6 hole golf course. On Friday there is the "open air market", where it's possible to buy fresh vegetables and more. Its also Tuscany's center of Crystal glass manufacturing at approx. 6 km. Access to Siena-Florence freeway is at approximately 6 km in direction Monteriggioni , passing the old monastery of Abbadia Isola. Unique Experience in Siena: from May to September, there is the possibilty to have dinners on the Streets togheter with local people, for the "Palio" Race, famous all over the world. It's very fanny and cheap !!! Other famous towns and cities such as Siena, Greve in Chianti, Radda in Chianti, Gaiole in Chianti, Florence as well as San Gimignano or Volterra are close, some less then 1 hour away. A must are also Pisa, Lucca, the coastal area as well as Lucca and Arezzo. Don't miss the southern part of Tuscany with its important wine towns such as Montalcino, Montepulciano or the famous Cortona, the chocolate town of Perugia or the Pecorino cheese town of Pienza. They will help you arranging Winery tours, Tastings, tours to the Crystal factories, hikes or bike rental as well as Cooking Classes and Tuscan specialties Dinners at the villa itself. The Villa is located along the "Via Francigena", the Medieval Pilgrims road that goes to Monteriggioni and Siena. The villa, situated right next to the famous pilgrim road Via Francigena, is located in the hamlet of Strove of "Etruscan" origins. It was later transformed into a Roman 'castrum' and again served military functions in the medieval wars between Siena and Florence. Since the walled fortress of Monteriggioni, dominating the country-side is very close, the hamlet of Strove was probably connected to the military machinery of the Siena republic. Actually the first historical mentions of the Villa and Strove talk of its partial destruction in the 14th century and its turning into a farmer's village. After the decline of the Siena republic the Villa was rebuild, its old remaining parts renovated. Internal and external prospects were transformed and enriched so it became a very elegant aristocratic family residence where contemporary poets and artists were hosted especially during summer season. Between the end of 17th century and the beginning of the 19th century, due to a very strong deforestation farming became good business. Consequently the 'Villa ' was transformed into a more sober country house with extend grounds cultivated with wine, olives, grain and fruits. But thanks to the efforts of the current owners, who bought the property in the 1800, the Villa as returned to its origins and splendor as a medieval villa around Siena. Attention "snowbirds" !! Tuscany offers pleasant temperatures, low rates, all major Italian sights within 1 days drive, hot spring and spa, dining and wining at its best. Alessandra and Emanuele were born in Siena, they are a well-travelled couple working in the business of Food Distribution - more precise of Tuscan specialities incl. Wine and Olive Oil. Alessandra loves to paint, to cook, to play tennis and to go horse riding. Emanuele loves to walk, to play tennis too. They are very friendly and happy to have Guests from all over the word Ask them or only for help or advise but have them introduce you to some of the most delicate food. It is a relaxing place with a wonderful views over the Siena hills. The Villa is very Spacious and you can rest at the Pool side under the "Grape Pergola". You can enjoy the Tuscany food and good wine. It is a very private place where you can stay on your own or to get in touch with the hamlet Tuscany inhabitants. Dont miss this unique experience !! No better place to experience italian every day life but also enjoy quietness and peace-enjoy the sunset in complete silence from your patio. Gaze onto the extended gardens, the skyline of the Chianti hills and the castle of Monteriggioni. Start your hiking and biking directly form your doorsteps . Enjoy a dream vacation in Tuscany's heart - only few miles from Siena and Florence, easy to reach from Pisa and Florence Airport - surrounded by the the world-famous landscape of extended vineyards, silvery olive groves, vast forests, colorful macchia and solitary trees. What a beautiful home and what what great people! The property and grounds were a dream come true. From the wonderfully restored living spaces to the fantastic pool and grounds this place was a real gem. The hosts advice and help added to the whole experience. Excellent early communication including detailed directions to the property and plenty of help and suggestions during our stay added to the experience. An excellent location for touring the Florence, Sienna region with a small local store for essentials within a few minutes walk. The pool was complete with changing area and towels plus some games equipment. Bed sheets were cotton and not synthetic. Views were amazing. We try to make our best to income our Guests just to let them feel the holiday house as home. We are Happier than them when we know they spent a good holiday. We hope to have you with your Family and friends as our Guests one more time. Our family had a wonderful stay for two weeks with 3 generations of family (and friends) all together to celebrate a 60th birthday. It was all a big surprise and our hosts could not have been more helpful or kind in making it a truly special and memorable trip. The meal we requested was spectacular and the kindness and generosity of the hosts really outstanding. We would definitely recommend to others. Thank you so much Alessandra and Emanuele. You have been perfect hosts to allowed us to spend a memorable stay !!! We enjoyed very much the big Villa and the large garden where we trained as members of an archery team partecipating to the world competition setted in Chianti during that days. We come back for another wonderful vacation. We enjoyed very very much with you during your stay in our house. You were Wonderful people. It has been very nice to meet "Archers"- "Gold Medals" and we told this to our friends. They told us: "It's good to know people with arches, they could be useful !!" We enjoyed very very much with you during your stay in our house. You were Wonderful people an very respectfully of the house. It has been very nice to meet "Archers"-"Gold Medals" and we told this to our friends. They told us:"It's good to know people with arches, they could be useful" :) We hope to enjoyed the wine and we hope also to have you another time in our house the next year. Kiss and love. Thank you very much, you were a fantastic group. We hope to see you again. 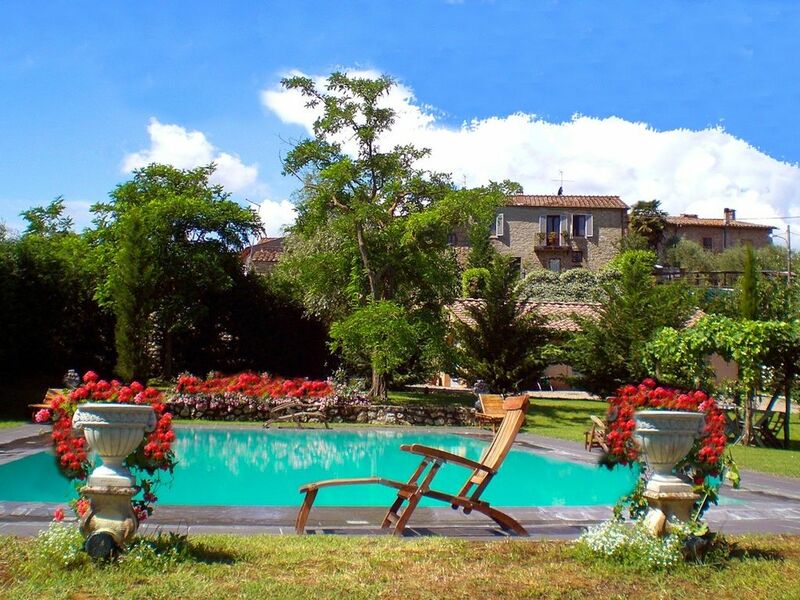 Très grande et charmante villa, idéalement placée pour visiter la toscane (45 min de Florence, 15 min de Sienne, 30 min de San Giminiano, 1h de Montalcino....). La villa est grande, avec une salle de bain par chambre, ce qui était très pratique (nous étions 5 adultes et 5 enfants). Nous avons profiter du jardin et BBQ, mais pas de la piscine car elle n'est ouverte qu'en mai. Les propriétaires, Alessandra et Emanuele, sont des hôtes adorables, prévenants et discrets. Ils font tout leur possible pour rendre votre séjour meilleur. Nous y retournerons avec grand plaisir!!! Thank you very much for your wonderful review. You were very Kind persons and Perfect Guest and with Lovely Children. We miss our guests !! We hope to have you again in Antica Magione. Merci beaucoup !! Do you want to experience the real Romantic Italian lifestyle of then and today - history and modern comfort? - then this Tuscany Villa is the place for you. The Villa representing 700 years of Siena and Tuscany history , was completely renovated some years ago and retouched in 2013 and is incorporated into the external, fortified walls of the ancient hamlet near Monteriggioni. Very private 5000 sq. well-cared park area with Pool (7x14 mt.) at exclusive use of our guests. The hamlet near Monteriggioni offers a restaurant, a bar/coffee shop, a small food shop as well as a public telephone . All within fewsteps reach . 10 min to the large Tuscany towns of Colle Val d'Elsa with more shopping facilities, pharmacy, hospital etc. Siena-Florence freeway 6 km. other famous towns and cities such as Siena, San Gimignano, Florence, Greve in Chianti, Radda in Chianti, Gaiole in Chianti, as well Lucca, Pistoia, Arezzo are very close, some less then 1 hour by car. If you drive a bit more, you will find Cortona, Perugia or Pisa. Ski: Skiing area in the Pistoia mountain about 2 hrs. drive.